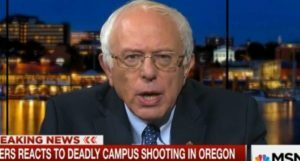 This Tuesday, presidential candidate Bernie Sanders once again linked the recent mass shooting at Umqua Community College to mental illness. This wasn’t the first time Sanders has conflated the two issues and that makes me nervous. Mental health policy based on the assumption that mentally ill people are more likely to murder others is not only untrue, but heaps stigma onto an already vulnerable population. 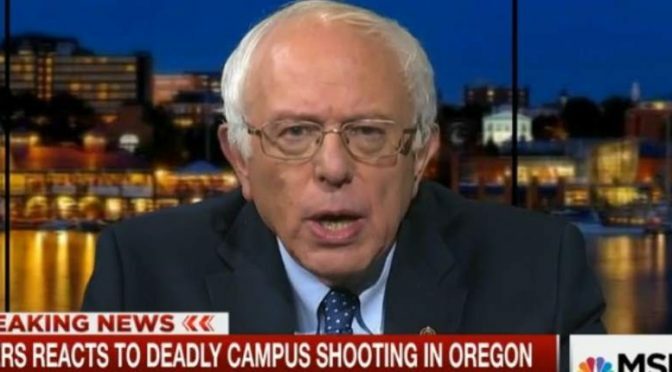 The day of the massacre, Bernie Sanders appeared on MSNBC. One of the first policy positions he took on the subject was that people who are mentally ill should not be able to own guns. Personally, I don’t have any desire to own a gun, but it’s utterly fallacious to lump disabled people and violent criminals together without even a pause. In the same interview, Sanders went on to demand more accessible, affordable mental health care. As someone who uses mental health services, I know how difficult it is to get what you need when you need it and how prohibitively expensive the whole process can be. I’m all for more accessible, affordable health care in general. However, I am concerned about what Sanders means by “care and attention immediately” in the context of mental illness and homicide prevention. Others have already written extensively about how mental health is being used as a scapegoat by the gun lobby. 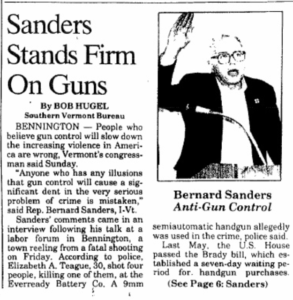 Sanders, a long-time supporter of gun rights, has bought into that lie. The facts are in: People with mental health problems are astronomically more likely to be victims of violent crimes than perpetrators. They are often the most vulnerable people in society: Homeless people, veterans and survivors of terrible trauma. Furthermore, banning mentally ill people from gun ownership is unlikely to even do very much to curb mass shootings. Only 3-5% of violent crimes in the United States are even committed by people with mental health problems. The assumption that mental illness and violence are linked leads to policy decisions that punish people for being disabled. In 2013, the National Rifle Association backed a bill that increased the scope of involuntary treatment for people who are mentally ill. The euphemistically named Helping Families in Mental Health Crisis Act, better known as the Murphy Bill is moving through Congress again. The Murphy Bill cuts patient advocacy access and community programs while promoting institutionalization and forced treatment options. It also rolls back privacy rights for people diagnosed with mental health disorders. I would like to encourage Sanders supporters to contribute to Kit Mead’s campaign to educate the senator about mental health and its lack of relevance to mass shootings. Participants are encouraged to contract Sanders through his social media accounts to try and educate him about the issues. I hope, given enough feedback from his supporters, that he reconsiders his stance. He hasn’t in the past, but perhaps a national stage and the accompanying pressure will be enough. I have just one question about the Bernie guy. Is Sanders self-funding his campaign like Trump, or he accepted a bribe?